“On Monday, May 23, 2011, our offices were alarmed at the startling news that three camps of internally displaced persons in the Delmas neighborhood of Port-au-Prince were effectively destroyed. This included the park at the intersection of Delmas Road and Airport Road which was destroyed at the hands of the Haitian police, under direction of Mayor Wilson Jeudy. This camp is home to several hundred people and is a microcosm of the over 800,000 officially-recognized displaced persons in Haiti. It is even more disturbing that this incident occurred during the day while many Haitian women and men were out in search of employment. Those who stayed behind witnessed the destruction of their belongings while some were violently beaten with batons by police. “During the same time, the United Nations Office for Coordination of Humanitarian Affairs (UN OCHA)Camp Coordination and Camp Management Cluster sent correspondence about the cancellation of this week’s cluster meeting, as well as the agenda for the next meeting which includes a discussion on the Martelly Administration’s ‘Return and Relocation’ pilot program. 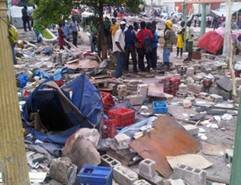 However, there was no acknowledgement about the violent obliteration of camps in Port-au-Prince. This is of great concern, and as United States Members of Congress, we will thoroughly look into this matter. “It is mind-boggling that any government official would condone or ignore such actions during a time when Haiti is seeking to recover from the crisis stemming from the January 2010 earthquake and the subsequent sluggish rebuilding process. Facing hostile conditions, including adverse weather, violence, and disease, shelter and work are the priorities for every displaced Haitian and must not be compromised. During President Martelly’s visit to the United States, we were all encouraged by his assertion that Haiti will face a new day—a new beginning. We extended, and continue to extend, our arms to assist and support the people of Haiti and its government as it transitions upward. We will not, however, idly stand by and hear such reports of evictions, without seeking an explanation or taking action.